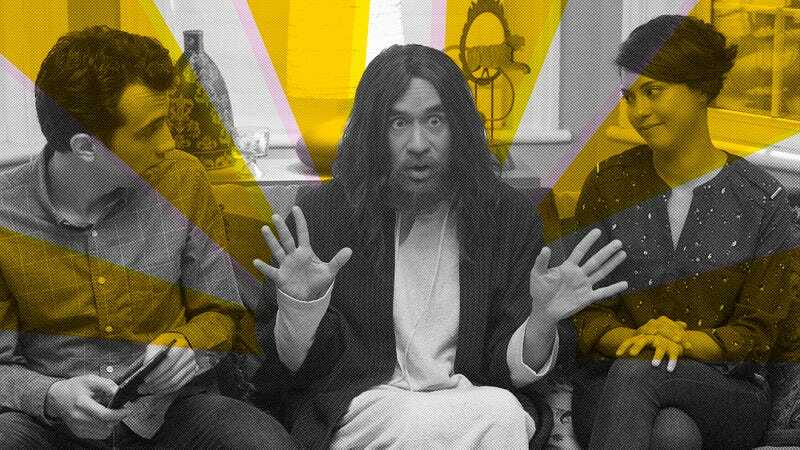 Jay Baruchel, Fred Armisen (as Jesus), and Rosa Salazar in Man Seeking Woman. Photo: Michael Gibson/FX, Graphic: Nicole Antonuccio. This Easter Sunday will see NBC’s live telecast of Jesus Christ Superstar with singer John Legend in the title role—the second, or third, or more likely, 102nd coming of Jesus as a pretty cool dude. The trope of our God being an awesome God, as well an awesome guy to hang out with, is a popular one in church youth groups, novelty tees, and music (see this previous Inventory, as well as pretty much all of Christian rock). And on occasion, films, movies, and TV shows have risked testing Jesus’ chill by taking that hip, affable image to potentially blasphemous extremes. Here are 15 examples of times Jesus was just alright with you.